Phew! 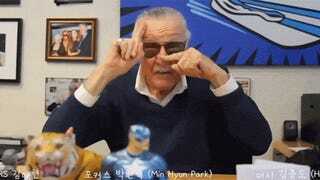 With all that Stan Lee has already done, you were probably wondering when he was going to appear in a Kpop video. Well, at the tender age of 92, it's happened. As tipster Sang points out, Lee makes a special guest appearance in Clara's new music video "Gwiyomi Song 2." You might remember the original from a few years back. Maybe not! Star News (via Sang) reports that Clara met Lee while visiting the U.S. for a series of meetings. She asked Lee if he would appear in the video, and he said, "yes." So here we are! Skip ahead to 4:11 to see Lee, who appears during the video's credits. The video has racked up over half a million views on YouTube as well as 1,800 likes and, ahem, around 2,600 dislikes.